Expectations often feel like chains when we feel compelled to act instead of eager and willing. By loosening expectations of ourselves and family we’ll stress less, enjoy our family and friends more, and be able to actively participate in the heart of the season. What’s tricky about expectations is you may not even realize you’ve altered your life to fit someone else’s view. Expectations often are unspoken. Either it’s the way a relationship has always been without questioning or you can tell if the circumstances of the expectation changed the other party would react negatively. We often play along to the expectations of others to make life easier—we think for both parties, but in reality it really only makes life easier for the other. It’s important to remember not all expectations are negative. It’s good to know what you or your family is hoping for and to honor what is within reason. However, many of the expectations we operate under (especially during times of stress) are unrealistic and unhealthy. While you might feel like you’re taking one for the team and making everyone happy, unrealistic or unhealthy expectations breed unhealthy behaviors. When we wear the expectations of others to the point we feel we must do this or things won’t be right, someone will be horribly disappointed or even mad at us, we’re letting this real or perceived expectation control our life. We’re seeking to please people rather than do what’s best for our family and spirit. 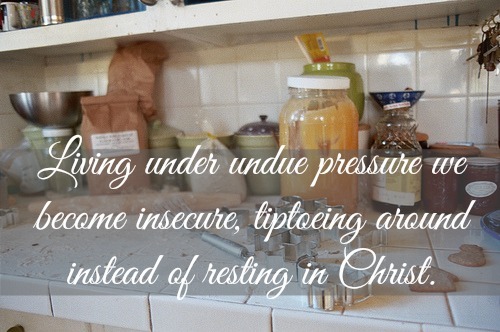 Living under undue pressure we become insecure, tiptoeing around fulfilling someone else’s expectations and seeking their approval, instead of resting in Christ and being comfortable in what he’s given us or called us to do. Expectations could be mandatory visits to both families even if it means filling up on two Christmas dinners and dragging tired, overstimulated kids across town or to the next county. It doesn’t matter if they enjoy it, as long as they’re there. Or matching present for present what another relative is giving you or a family member. Perhaps you’ve put on the expectation that to make Christmas special you have to do a Bible-based activity every day. For me, I get nervous and begin to worry what family members think when it comes to Christmas gifts. I’ve made my own gifts (for the most part) for the last 7 – 8 years. Most of my family enjoy and look forward to whatever I’m making for the year. However, some family members aren’t the handmade type. While this has never been said, you can tell by their reaction to homemade gifts that they’d rather do without it. Last year as I made a list of supplies, I started thinking of how I could make presents look more store bought and fancy. In my head, I needed more gifts or an elaborate project. I wrapped my acceptance in my gift giving and was beginning to hike up my stress meter to appease someone else’s (perhaps) expectation. I ended up going back to my original list. A gift is not worth putting undue pressure on myself. It’ll only steal my joy. Let’s get practical. And honest. It can be uncomfortable, and I’m sure in some families it will be uncomfortable, but that hard lesson of living to please the Lord and not men? We need it. What expectations have you put on yourself? What’s healthy? What’s realistic? 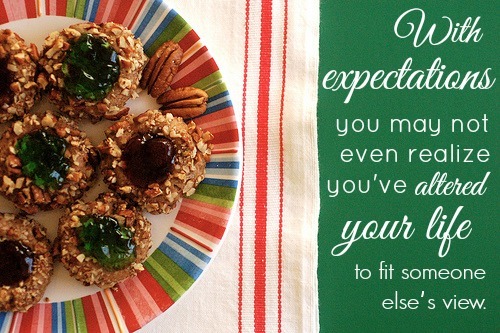 What expectations does your immediate family (or those you live with) have? Are they realistic? What’s important to them at/about Christmas? 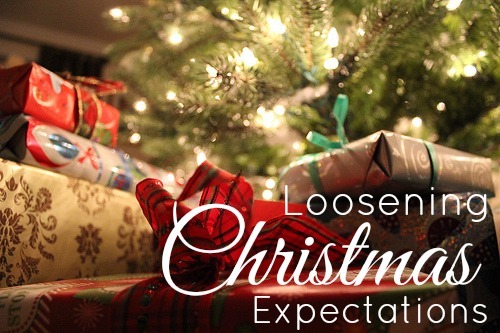 What expectations does your extended family have? Are they healthy? Are they realistic? Keep expectations, hopes, or wishes that are healthy and meet the goal, the heart, and mission of your family. Don’t be afraid to disappoint others. Some will be. Talk to them about why these changes are important to you and your family. Are there areas of your celebration and life where expectations need to be loosened? Identify some and make a plan (of action) to loosen them. For more posts in the series visit the A Joy-Filled Christmas page or subscribe to the blog and get posts emailed to you!